1. 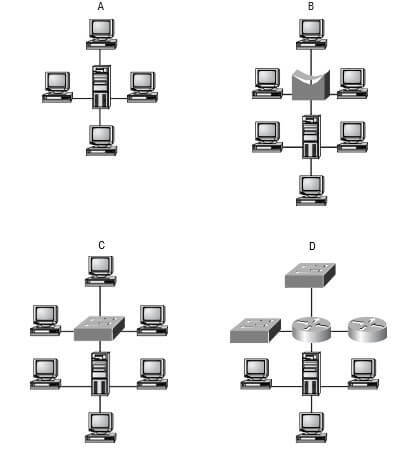 Which layer chooses and determines the availability of communicating partners, along with the resources necessary to make the connection; coordinates partnering applications; and forms a consensus on procedures for controlling data integrity and error recovery? 2. Which layer is responsible for converting data packets from the Data Link layer into electrical signals? 3. At which layer is routing implemented, enabling connections and path selection between two end systems? 4. Which layer defines how data is formatted, presented, encoded, and converted for use on the network? 5. Which layer is responsible for creating, managing, and terminating sessions between applications? 6. Which layer ensures the trustworthy transmission of data across a physical link and is primarily concerned with physical addressing, line discipline, network topology, error notification, ordered delivery of frames, and flow control? 7. Which layer is used for reliable communication between end nodes over the network and provides mechanisms for establishing, maintaining, and terminating virtual circuits; transport-fault detection and recovery; and controlling the flow of information? 8. Which layer provides logical addressing that routers will use for path determination? 9. Which layer specifies voltage, wire speed, and pin-out cables and moves bits between devices? 10. Which layer combines bits into bytes and bytes into frames, uses MAC addressing, and provides error detection? 11. Which layer is responsible for keeping different applications’ data separate on the network? 12. Which layer is represented by frames? 13. Which layer is represented by segments? 14. Which layer is represented by packets? 15. Which layer is represented by bits? Fill in the blanks with the appropriate layer of the OSI or hub, switch, or router device. In Figure, identify the amount of collision domains and broadcast domains in each network. Which Cisco layer is responsible for breaking up collision domains? PDUs at the Network layer of the OSI are called what? At which Cisco layer would broadcast domains be defined? PDUs at the Data Link layer is named what? Segmentation of a data stream happens at which layer of the OSI model? For which of the following would you not need to provide a crossover cable? What does the Data Link layer use to find hosts on a local network? How is a crossover cabled? Where are routers defined in the OSI model? At which layer of the OSI are 1s and 0s converted to a digital signal? Bridges are defined at what layer of the OSI model? What Cisco layer provides segmentation of contention networks? What is used at the Transport layer to stop a receiving host’s buffer from overflowing? Which layer of the OSI provides a translation of data? Routers are typically used at which layer of the Cisco three-layer model? How many bits define a hardware address? Which of the following is not an advantage of a layer model? Which three options use twisted-pair copper wiring? What does the “Base” indicate in 10BaseT?